Overseas visitors looking to work in Australia under the 485 visa must have ‘adequate 485 visa health insurance’ to meet visa condition 8501. While this condition is compulsory for visa applicants and current visa holders the good news is there are a wide range of health funds that offer these policies, and one is HIF. The below HIF review focuses on the most important elements individuals have concerning HIF and their cover for 485 visa holders. Is HIF A Trustworthy Australian Health Fund? Yes, HIF (Health Insurance Fund Of Australia) is one of Australia’s oldest health insurance companies with 60+ years experience (it was established in 1954). The health fund recorded revenue from premiums of $110 million for the 2013/14 year. In WA it has a 55% market share with growing policyholder interstate. The fact that the company is WA based shouldn’t deter 485 visa applicants moving to another state as they cover hospitals and providers in Australia (as explained below). Are HIF’s Health Insurance For 485 Visa Holders Cheap? 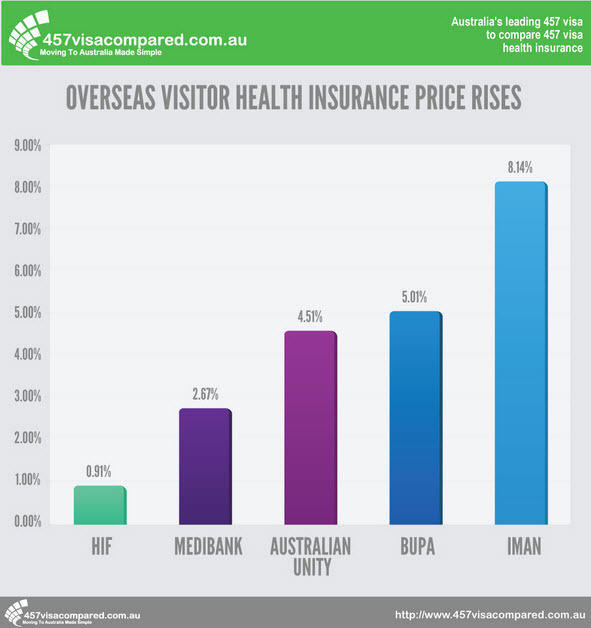 Yes, since April 2014 HIF has offered some of the cheapest health insurance for 485 visa policies due to the fund increasing their policies the least of all the major 485 visa health insurance companies. The graph below shows how HIF only increased their premium by 0.91%. The largest increase was IMAN (who formally were the cheapest) who rose their rates by 8.14% in May. HIF has the ability to offer some of the cheapest health insurance for 485 visa holder policy rates as it is not-for-profit. This means that unlike most other Australian health insurance companies the fund is owned by members with no stakeholders (including shareholders) to pay dividends to. This means that profits circulate back into the fund as either lower policy prices or through improved product features. Only HIF’s working visa policies meet the 485 visa health insurance requirements set by DIBP. Their standard health insurance policies are only for Australian permanent residents and should not be considered when applying for the subclass 485 visa. There are three working visa policy options including essential, intermediate and comprehensive cover. This 485 visa health insurance comparison site only compare’s their essentials cover to other budget policies but if you navigate to the 457 visa health insurance section you have options to compare the other two policies. It should be noted that 457 visa holders have the same condition 8501 requires as 485 visa holders so any cover designed for one subclass is also applicable for the other. Can I Choose My Own Provider? Most 485 visa health insurance providers give you a list of preferred providers which you need to visit or you will incur significant out-of-pocket expenses. HIF on the other hand doesn’t force policy holders to either go to a certain hospital and extra’s provider (eg dentist). Their members can choose their provider with HIF committed to providing strong rebates irrelevant of this choice. So Overall, Should I Choose HIF? 1) Their 485 visa health insurance premiums are some of the lowest in Australia and their history of price rises means that you can have ‘peace of mind’ that they won’t just dramatically hike up your policy prices when you join. Overall, they have the cheapest health insurance for 485 visa policies. 2) They cover all of Australia. This includes access to 500+ private hospitals for their premium policies and all the public hospitals for the budget cover. 3) They make it easy to join online with an instant 485 visa compliance letter sent that you need to add to an application. 4) They have outstanding customer service with real Australian’s taking your calls that know health insurance for 485 visa holders inside-out.